Home Science Can droplets that ‘dance’ purify water? Can droplets that ‘dance’ purify water? We’ve all seen dew droplets form on spider webs. But what if they flung themselves off the strands instead? As long as the strands are moderately hydrophobic and relatively thin, small droplets combining into one are apt to dance themselves right off of the tightrope. Researchers say this peculiar phenomenon could form the basis of new coalescer technologies for water purification, oil refining, and other applications. 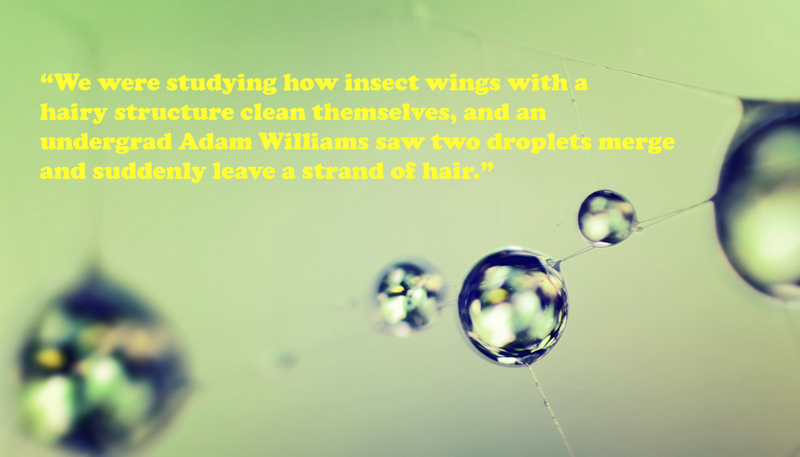 “We were studying how insect wings with a hairy structure clean themselves, and an undergrad Adam Williams saw two droplets merge and suddenly leave a strand of hair,” says Chuan-Hua Chen, associate professor of mechanical engineering and materials science at Duke University. But thanks to some ingenuity from Kungang Zhang, a graduate student in Chen’s group, the researchers discovered that the “dancing droplets” are real, and are more likely to propel themselves off of a strand if they merge from opposite sides—a finding that allowed the team to study the phenomenon in detail. As reported online in the journal Physical Review Letters, as a droplet grows larger, it stores energy on its expanding surface. When two droplets merge, the mass stays the same, but the surface area decreases. This causes a small amount of energy to be released. As long as the drops are only attached to a small solid area, the released energy is enough to fling them away. This remains true as long as the strand is reasonably hydrophobic, such as the Teflon-coated fibers in the experiment, and the diameter of the strand is a few times smaller than that of the droplet. In previous research, researchers have shown a similar self-cleaning method from the wings of cicadas where droplets could launch themselves from a flat surface. That surface, however, was super-hydrophobic due to the nanostructure of the wings. A potential application of the dancing phenomenon is in water purification technologies. Current methods use gravity or shearing forces to remove accumulated droplets from fibrous webs, much like those found on your morning walk through the woods. If the droplets get too large, however, they can clog the gaps in the web. But with this new finding, fibrous woven materials could be engineered with Teflon-like coatings and large enough gaps to never clog before droplets jump off. Researchers at the University of British Columbia contributed to the study that received funding from the National Science Foundation.